9 x M610 Blades each with 2 x Xeon E5645, 250GB Hard Drive. Dell M1000e includes. Dell M1000e Server Chasis Enclosure SEE PICTURES. Used Dell M1000e Chassis. 6x Dell Power Supplies. 9x Dell Rear Fans. 7x Front Blanks. 4x Rear Blanks. 2x 1GBe Passthrough Modules. 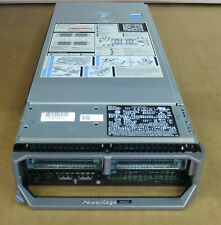 1 x Dell PowerEdge M1000e 16 Slot Blade Chassis. Midplane Version 1.0. 9 x Fans YK776. 6 x Power Cables. Dell PowerEdge M620 Blade for M1000e Systems. 1 x Dell PowerEdge M620 Blade With. 128GB RAM (8x 16GB DDR3) -MGY5T. 2 x 300GB 10K SAS 2.5" Hard Drives HDD -740Y7. Dell PowerEdge M1000e Blade Enclosure with 4 x M520 Blades. v1.1 Midplane for up to 16 x Half Height Blades or 8 x Full Height Blades(4 x M520 Blades Installed). 16GB (2x8GB) DDR3 RAM. 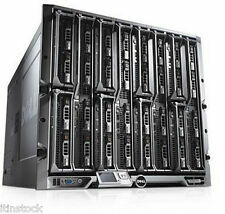 Dell Servers HP Servers Hard Drives Powervault Arrays Equallogic Storage Networking Tape Drives. 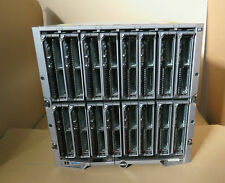 DELL M1000e BladeSystem with 16 x M610 Server Blades. 16 x DELL PowerEdge 11G M610 Server Blade. OS (Evaluation ver) Tested with VMWARE ESXI 6.5 / Windows 2012 / windows 2016 HPC / Windows 10. 192 CPU Cores / 384 Threads. Dell M1000E ( version 1.1 10Gb midplane). Rail kit to mount M1000e in a Rack. 8x poweredge m620 servers in CTO state. However we may use our discretion also to provide the safest and best service. 2x M6348 blade switch. DELL M1000e BladeSystem with 16 x M610 Server Blades. 16 x DELL PowerEdge 11G M610 Server Blade. 192 CPU Cores / 384 Threads. (Each Server Blade). 2.3TB SAS Storage. Storage 1 x 146gb 10K 2.5" SFF SAS. Dell PowerEdge M1000E Blade Chassis. This Chassis contains 5x Dell PowerEdge M610 Servers and 11x blanking plates. ALL HARD DRIVES HAVE BEEN REMOVED. There is a reason we use quality boxes and anti-static bags. Up to 16 DXM610 workstation blades can be installed into the award winning Dell M1000e enclosure. The enclosure has mulitple redundant power supplies and space for a range of modular network interfaces. DELL M1000e BladeSystem with 16 x M610 Server Blades. 16 x DELL PowerEdge 11G M610 /DXM 610 Server Blade. (Each Server Blade). OS (Evaluation ver) Tested with VMWARE ESXI 6.5 / Windows 2012 / windows 2016 HPC / Windows 10. Dell PowerEdge M1000e Including Dell PowerEdge M1000e Blade Server Enclosure. Dell M1000e V1.1 Midplane Board. Dell M1000e IKVM Module. 9 x Dell M1000e Fan Modules. 1 x Dell PowerEdge M620 Blade Server (Spec below). 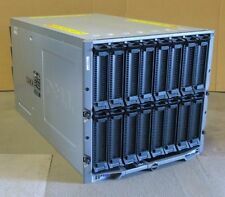 1 x Dell M1000E Blade CISCO 10GB Etho Catalyst SWITCH Fibre Modules. CHECK OUT OUR OTHER GREAT DEALS. DELL M1000e BladeSystem with 16 x M610 Server Blades. 16 x DELL PowerEdge 11G M610 Server Blade. (Each Server Blade). OS (Evaluation ver) Tested with VMWARE ESXI 6.5 / Windows 2012 / windows 2016 HPC / Windows 10 / Ubuntu. Dell PowerEdge M1000e v1.1 with 16 x M620 Blades 10U Rack Enclosure. H310 RAID Levels: 0, 1, 5, 10. 32GB (8x4GB) DDR3 RAM. Dell Servers HP Servers Hard Drives Powervault Arrays Equallogic Storage Networking Tape Drives. Dell PowerEdge M1000e Including Dell PowerEdge M1000e Blade Server Enclosure. Dell M1000e V1.1 Midplane Board. Dell M1000e IKVM Module. 9 x Dell M1000e Fan Modules. 4 x Dell PowerEdge M630 Blade Server (Spec below). Dell PowerEdge M1000e Including Dell PowerEdge M1000e Blade Server Enclosure. Dell M1000e V1.1 Midplane Board. Dell M1000e IKVM Module. 9 x Dell M1000e Fan Modules. 8 x Dell PowerEdge M630 Blade Server (Spec below). 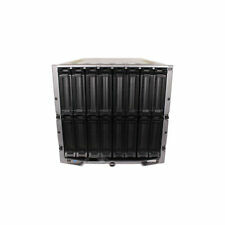 DELL PowerEdge M1000e Modular Blade Enclosure with 16 x M610 Blades. DELL PowerEdge M1000e Modular Blade Enclosure. takes up to 16 x half-height blades (ALL 16 x M610 blades included). 16 X DELL POWEREDGE M610 BLADE. Dell PowerEdge M1000e Including Dell PowerEdge M1000e Blade Server Enclosure. Dell M1000e V1.1 Midplane Board. Dell M1000e IKVM Module. 9 x Dell M1000e Fan Modules. 1 x Dell PowerEdge M630 Blade Server (Spec below). M5424 0F855T. CHECK OUT OUR OTHER GREAT DEALS. 64GB DDR3 RAM. No Hard Drives (2 x 2.5" Hard Drive Bays).